The hybrid XC60 crossover has a 280-hp turbocharged four-cylinder gasoline engine and a 70 hp electric motor. Volvo put a T8 badge on the concept because the hybrid's combined 350 hp is equivalent to that of an 8-cylinder engine. Volvo will show a gasoline plug-in hybrid crossover concept at the Detroit auto show featuring technology that eventually will go on vehicles destined for the U.S. and Chinese markets. The XC60 Plug-in Hybrid Concept has a range of as many as 600 miles (965km) in hybrid mode and can go as many as 35 miles on the electric motor. Combined fuel economy is more than 50 mpg (4.7 liters per 100km), Volvo said. The hybrid crossover has a 280-hp turbocharged four-cylinder gasoline engine and a 70-hp electric motor. Volvo said it put a T8 badge on the concept because the hybrid's combined 350 hp is equivalent to that of an eight-cylinder engine. The new four-cylinder gasoline powerplant is part of the new Volvo Environmental Architecture, or VEA, engine family. Volvo said a gasoline hybrid will go on sale in the United States but did not provide a detailed timetable. 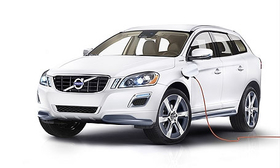 Although Volvo is showing its new gasoline hybrid powerplant in the XC60 crossover, "it is too early to say which model will be the first to feature this solution," Volvo CEO Stefan Jacoby said in a statement. The electric motor is in the rear axle and is powered by a lithium ion battery pack that sits under the floor. Volvo said recharging takes 3.5 hours from a 220-volt outlet, and 7.5 hours using the standard 110-volt outlet in U.S. homes. The new gasoline engine is combined with a new eight-speed automatic transmission. Volvo's first production hybrid, the diesel-electric V60 Plug-in Hybrid, will go on sale in Europe this year. Volvo's VEA four-cylinder engines will replace all of the company's four-, five- and six-cylinder powerplants starting in 2013 or 2014. Volvo executives say the smaller displacement engines will have the power and performance of its current range. "In the XC60 Plug-in Hybrid Concept we demonstrate that our forthcoming four-cylinder engines offer the same high performance as today's sixes. At the same time, their fuel consumption will be lower than in current four-cylinder engines," says Peter Mertens, Volvo's senior vice president of r&d. "It's time to stop counting cylinders. Four-cylinder engines are the most effective way to quickly reduce CO2 emissions and fuel consumption without compromising customer expectations when it comes to driving pleasure and performance." The new VEA engine family will have modular gasoline and diesel powerplants, Volvo said. The gasoline versions will have direct injection and balance shafts to improve vehicle comfort. Volvo said it will be able to use varied levels of turbocharging that give it the flexibility to develop engines with unique horsepower and torque. The modular engines will have 30 cubic inches per cylinder. A three-cylinder powerplant is possible, Volvo said. Volvo said the new engine family will use fewer parts, making manufacturing easier and assuring higher quality. The new powerplants are lighter than today's engines, according to Volvo, which did not provide specifications. Volvo also said fuel economy will increase up to 30 percent from its current range of engines.